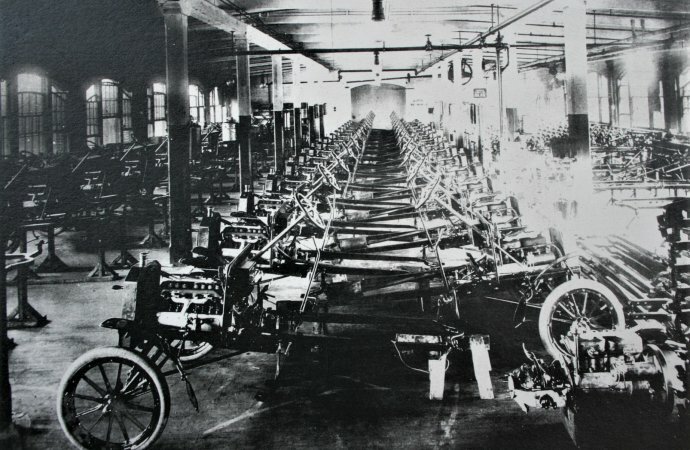 By the time Henry Ford was 40, he had twice failed at building a successful automobile company. 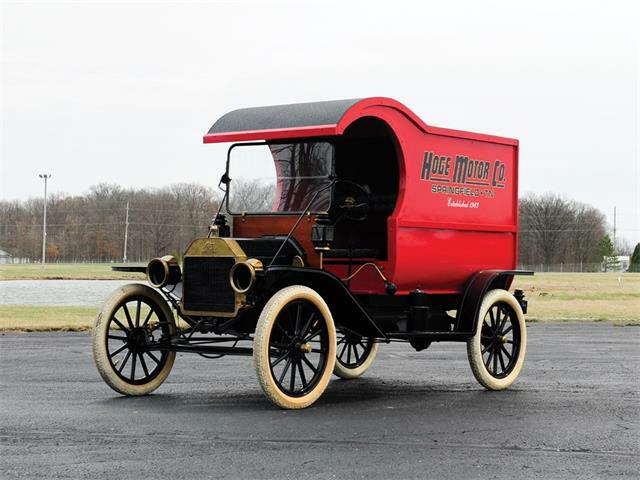 But his tenacity moved him to try again and in June 1903 he pulled together a group of investors to form the Ford Motor Company. Though he was not president of the new firm, he was able to pursue his most important objective of producing an “everyman” vehicle that would eventually change the American landscape. 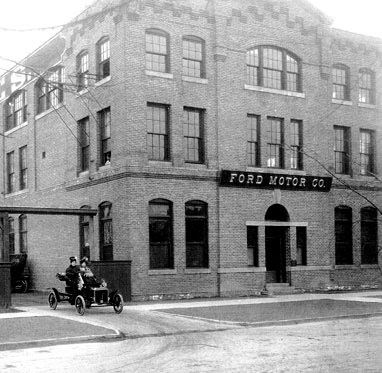 Today, Ford’s first purpose-built factory still stands, the three-story brick Piquette Avenue Plant which was located just a few blocks from where Henry, his wife, Clara and son, Edsel, lived. Henry had no cash, but he offered experience and hard work which led the investor group to get the building in place so he could design and build vehicles with the help of a talented group of mechanics, draftsmen and fabricators. 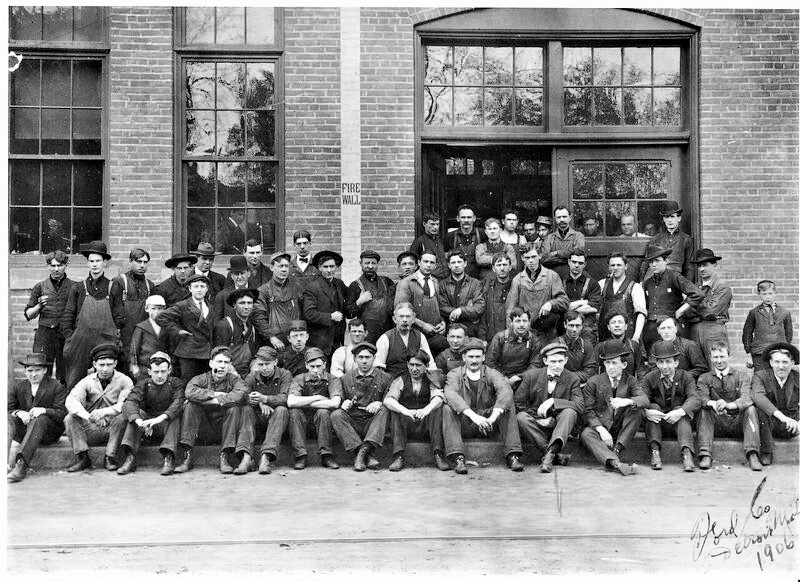 From 1904 to 1910 the building at 461 Piquette (which is a French term for a very simple wine) served as the first true assembly plant for the fledgling company with additions added during those years to meet the growing demand for Ford’s alphabet cars…the models B, C, F, K, N, L, R, and S.
The company’s Model A and Model AC were built in the first Ford location, a rented wagon-manufacturing shop on Detroit’s Mack Avenue, and weren’t assembled in the newly constructed building. The original Mack Avenue building burned to the ground in 1941, but was replicated by Ford (at one-fourth the size) for placement in Greenfield Village in 1945. A Detroit-based architectural firm, Field, Hinchman & Smith, designed the Piquette Plant as an example of late Victorian-style architecture modeled after New England textile mills, which was a common practice in the United States at the time. Three stories high, 56 feet wide, and 402 feet long, its load-bearing exterior brick walls contain 355 windows, and its maple floors, supported by square oak beams and posts, cover 67,000 square feet. The building contains two elevator-stairwell combinations, one located on its northwest corner and the other located on the southwest side. 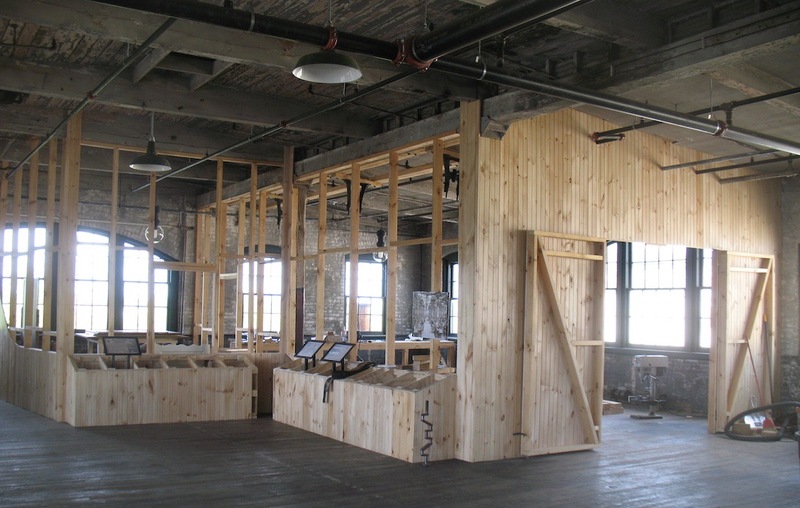 Recalling a fire in March 1901 that destroyed the Olds Motor Works factory in Detroit, Henry Ford and the architects included a fire sprinkler system in the building’s design, a rare feature for industrial buildings of the period. This and several other original safety features in the factory, such as firewalls, fire doors, and fire escapes, are still present. Water for the sprinkler system was supplied by a wooden water tank located on the building’s roof. 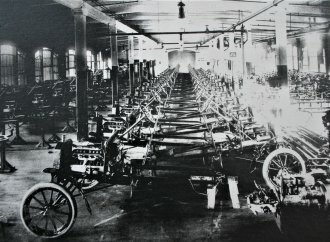 The Piquette operation was a flurry of activity during those early years as Ford developed models that provided more dependability and features. There was disagreement among the investors on just what direction the company should go. Alexander Malcomson, one of Ford’s primary benefactors, supported the idea of Ford building more luxurious machines and the company did, in fact, produce fancier cars that including the models R and L, which were variations off the company’s popular Model N.
But Henry Ford had a vision and in January 1907 he summoned Charles Sorenson, a company patternmaker who translated Henry’s sketches and descriptions into prototypes, to the nearly empty third floor of the Piquette facility. He told Sorenson he wanted a special room constructed which would have a locked door and enough space to begin work on a completely new job. 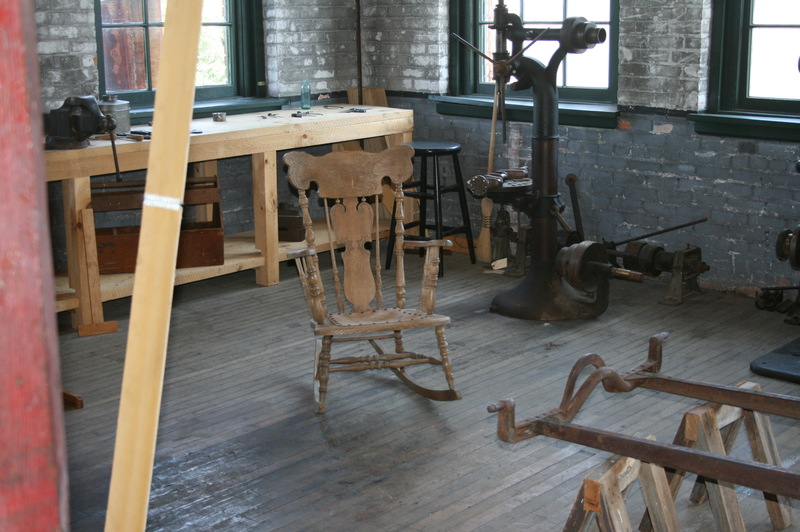 He wanted Joe Galamb, a company engineer, to be located in this space and soon after the room was completed with some basic manufacturing equipment… a drafting table, blackboard, camera (for recording pictures of ideas), workbench, tools and belt-driven lathe, drill press and milling machine. The ”secret room” became home to just a few of Ford’s most trusted employees. 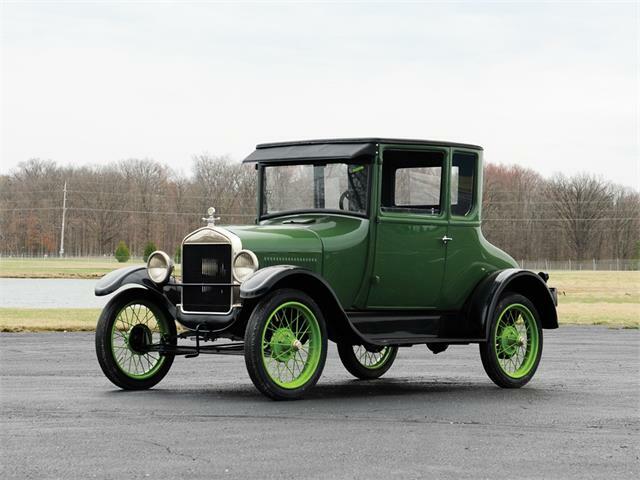 The room essentially became the maternity word for the Model T, Ford’s idea of the perfect vehicle for the motoring family. It would be light, durable and affordable and it would change the fortunes of not only the fledgling company, but the automotive industry as well. 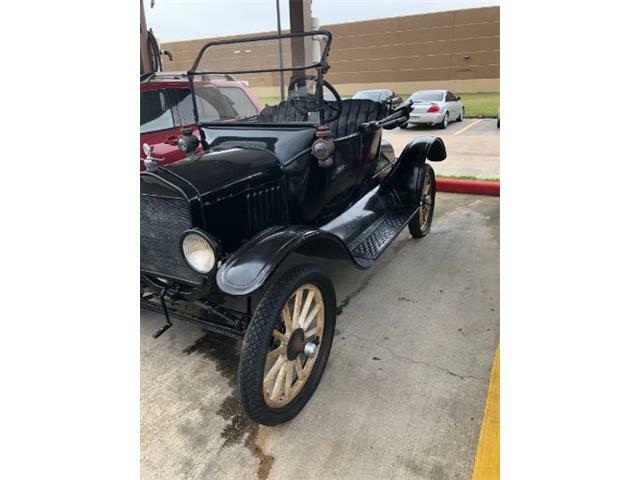 Ford was not interested in continuing to develop luxury vehicles and when Malcomson continued to push for that product, Ford bought his partner out, taking over the reins of the company as president. Within a year, the first running prototypes were driven out the doors of the room and suddenly the world was introduced to Ford’s newest idea for automotive innovation, simplicity and ruggedness. A formal public debut happened on October 1, 1908, which followed by just a few days the first official production. 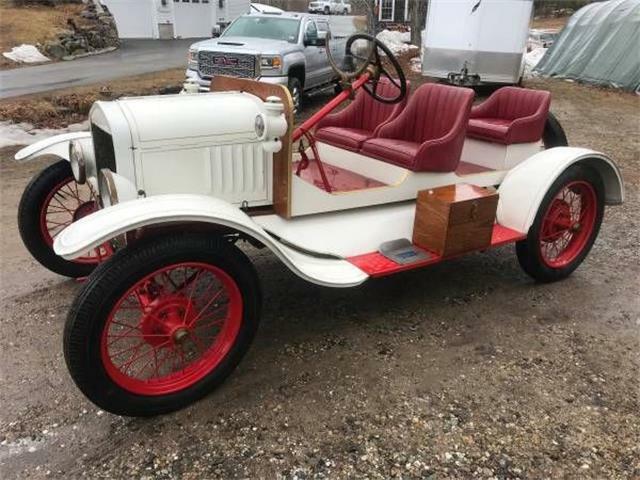 The Model T was an instant success, priced at $850, which was lower than many of the time’s contemporary vehicles, but higher than the company’s Model N.
For the next 15 months, Ford Motor Company produced 12,000 Model Ts in the Piquette factory. However, demand was much higher than actual production and continuing to add expansions onto the building was not going to meet the needs for additional production space. 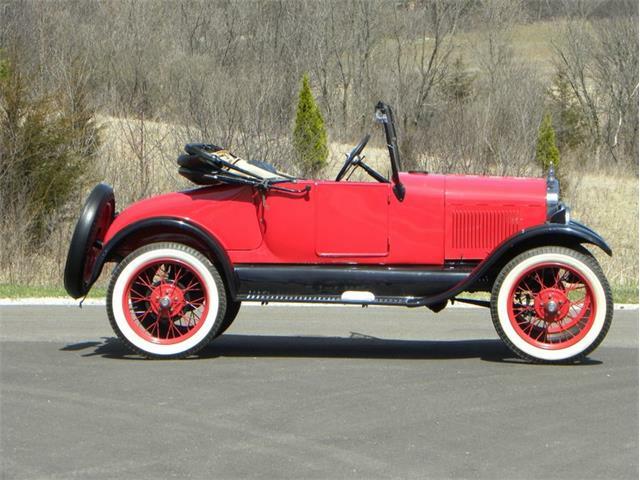 In January 1910, the company built an expansive new factory in nearby Highland Park, selling the Piquette building to Studebaker Corporation, which produced its line of vehicles in the building until 1933 when it also outgrew the space. 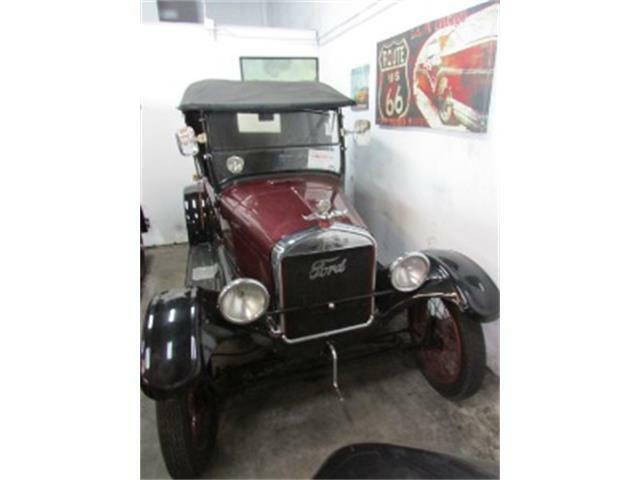 In those early years, Ford was one of 22 automobile companies operating in what was called the Milwaukee Junction area of Detroit (the Piquette building was occupied by 3M and by the Cadillac Overall Company for short periods of time. In 2000, the building, which had suffered deterioration and was in danger of demolition, was saved by an organization called the Model T Automotive Heritage Complex (T-Plex), which acquired the Piquette structure with the intention of preserving it and the heritage of the Ford Model T.
Today the Ford Piquette Avenue plant is well preserved and largely unchanged from its original 1904 appearance. 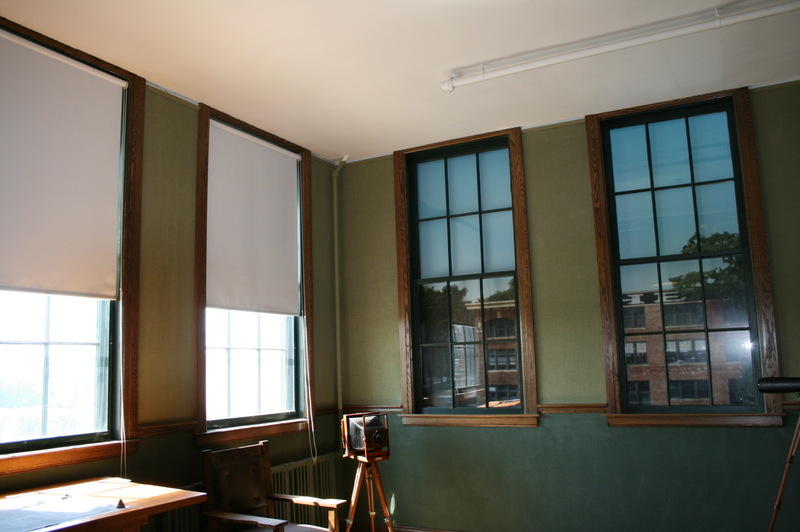 The exterior of the building is immediately recognizable as the same building shown in early photographs — still in its original red brick, complete with original fire escapes and windows. 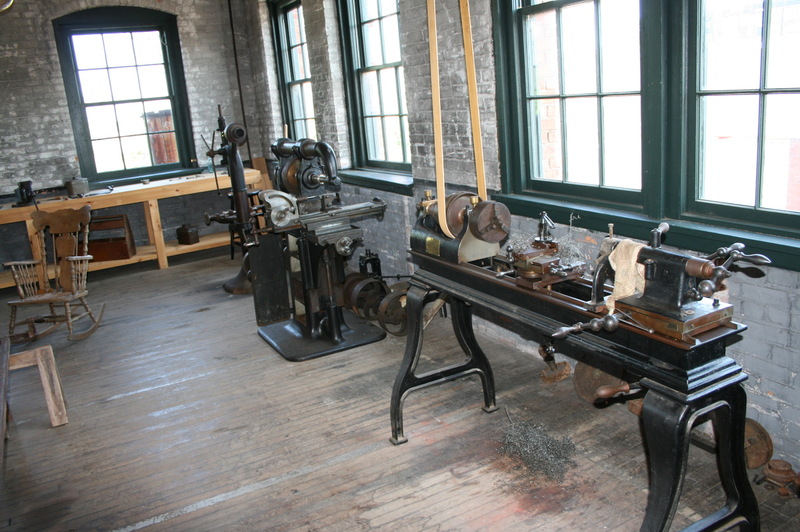 Various Model Ts and other Piquette-era Fords are on display throughout the second and third floors, with several dozen interpretive panels explaining the history of the building and the people who worked there. 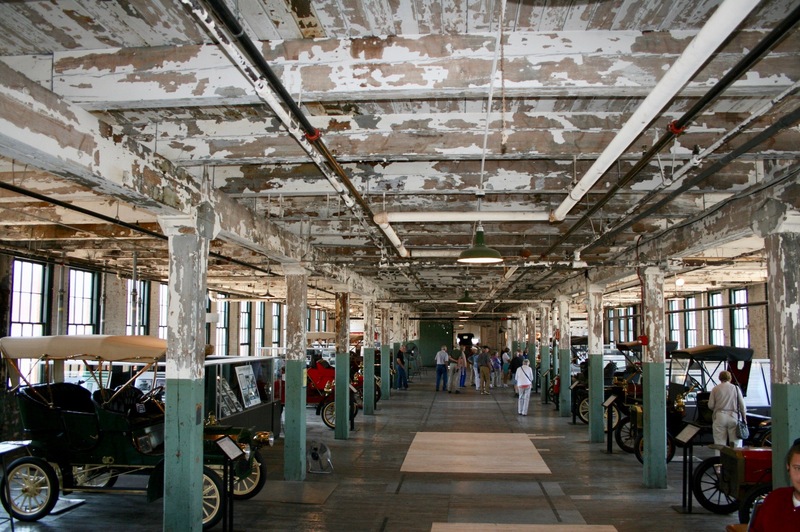 The Piquette Avenue Plant is the oldest purpose-built automotive factory building open to the public. 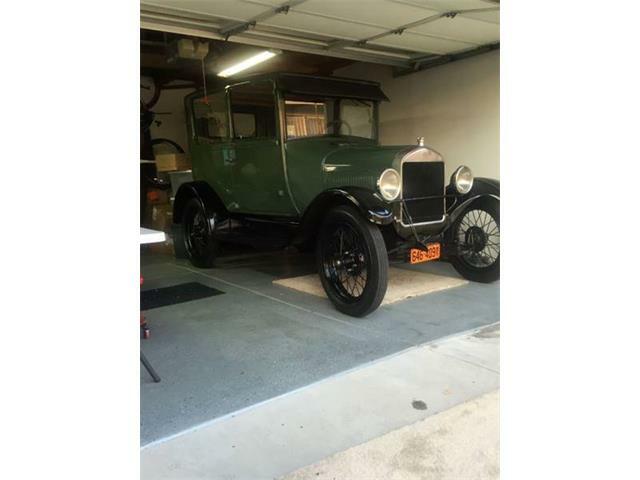 The museum has exhibits that primarily focus on the beginning of the United States automotive industry and was added to the National Register of Historic Places in 2002, became a Michigan State Historic Site in 2003, and was designated a National Historic Landmark in 2006. For information on visiting, see the Piquette Avenue Plant website. Thank you Classic Cars Journal and Joe Volgarino.Wondwrful.article.Reminds me of the great Hemmings Classic Cars mag too. THANK YOU. 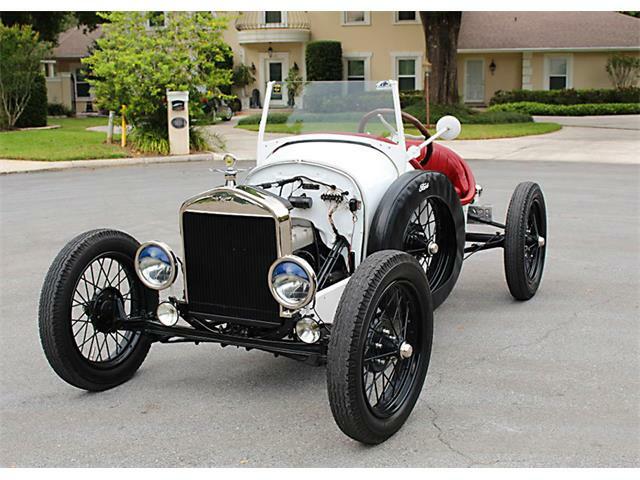 MY LOVE FOR MODEL T AND A’S STEM BACK AS A CHILD! 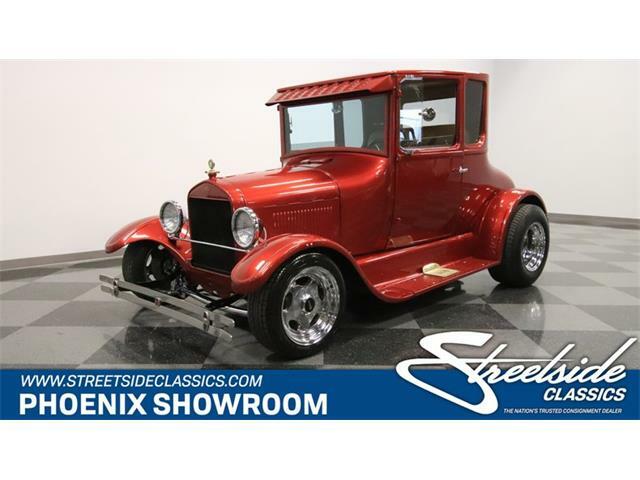 IT IS A GREAT HISTORY OF AMERICA’S PAST CAR MANUFACTURING. Thanks for sharing this forgotten part of History of Ford and Thank You Classic Cars Journal and Joe Volgarino.for this Wonderful article .Hope to see and read more..
A trip to Detroit to tour the some the historic sites operated by Ford Motor Co. is on my bucket list. This would include this building, the Henry Ford Museaum, Greenfield Village, and anything else that’s open to the public. 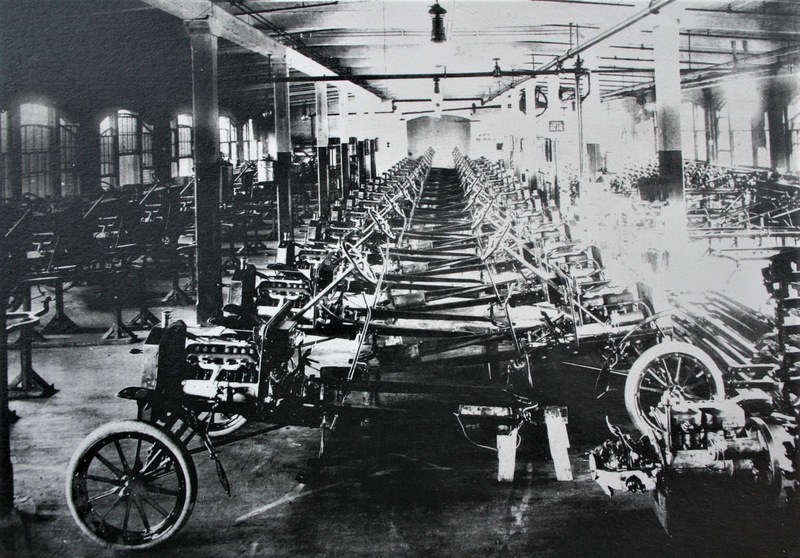 For all his personal flaws, Henry Ford was a visionary in the early automotive industry. 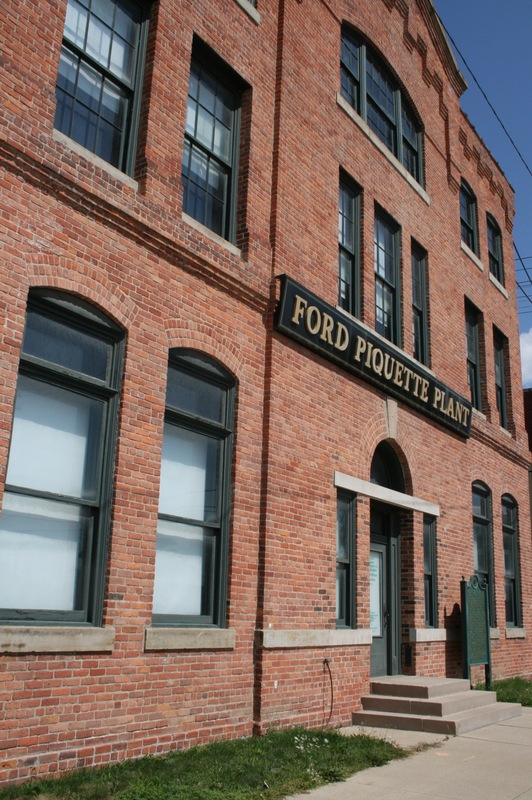 I think touring Ford operated sites would be great, but the Piquette Plant is an independent non-profit, they aren’t owned, operated, or supported directly by Ford. Great article! So happy the Piquette Ave factory was saved. I was there at its opening. 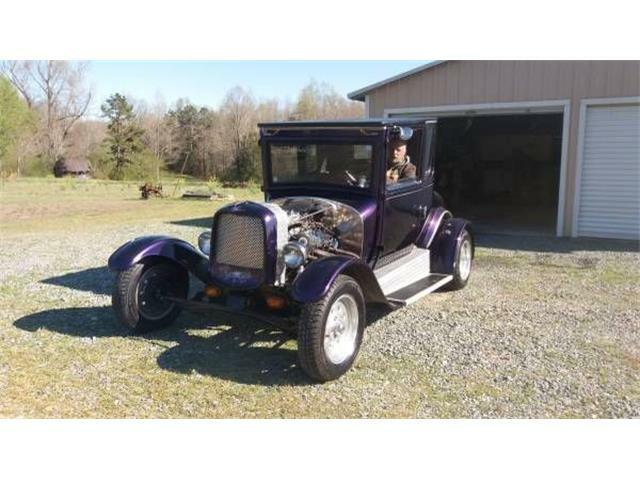 The list of alphabet Models are correct with the exception that Ford never made a Model L. That is incorrect.